Mark Moffett is a photographer and explorer who travels the world looking for new species and scientific wonders. 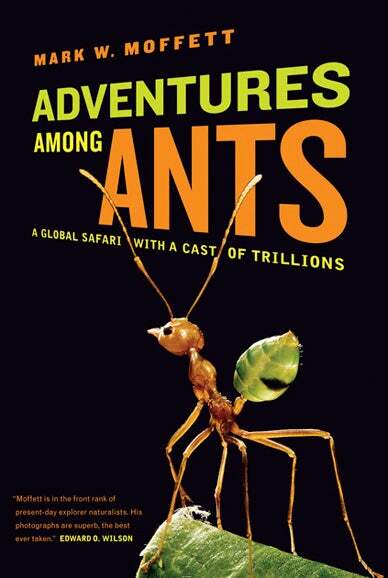 In his latest book, Adventures Among Ants, he takes you deep into "extreme ant societies." Here's an excerpt, about ant hive minds. Although we think of all ants as small, they vary in size several thousandfold. The average species has workers a little less than 3 millimeters (an eighth of an inch) long. But ants at the small end of the spectrum, such as Carebara atoma, the "atom ant," are truly Lilliputian. I once dislodged a flake of bark from a tree in Singapore only to expose four hundred yellow specks: an entire colony of its close cousin Carebara overbecki. The minor workers were almost the size of an atoma, their oval heads as small as a single-celled paramecium. The slightly larger soldiers have elongated heads with two little horns. A large, "major" worker of the species at the other end of the scale, the carpenter ant Camponotus gigas, also found in the Malay Peninsula, is nowhere near the car size of the ants that terrorized Los Angeles in the 1950s cult film Them! At a little more than an inch long, she is indeed only fair-to-middling in size among insects and falls far below the world record holder for an adult insect, a female giant weta cricket I collected on Little Barrier Island in New Zealand (it weighed 71 grams, three times as much as a lab mouse). Ant expert Blaine Cole once observed that ant species with bigger workers tend to show a greater number of behaviors, and he proposed this might be because of their larger brains. Still, Camponotus gigas workers don't strike me as being especially quick-witted, and indeed there are many physical advantages to staying relatively small. Although the ant's little body loses heat and water more easily than yours or mine and overheats more swiftly in the sun, it also circulates nutrients without as complex a cardiovascular system. An ant's size enables her to climb almost effortlessly and fall without the possibility of breaking a leg. Ants float or swim when caught in a downpour, and survive long periods of immersion thanks to their sluggish metabolisms. But looked at another way, ants aren't small at all. A leopard may impress with her bulk and power, but compared to the ant, she is a minor part of the ecosystem in which she lives-measured in terms of both her ecological impact and her size. This is what Them! and most other science fiction has missed: ants have, in effect, two body sizes: the individual's and the colony's. To under­stand this basic truth, I use a mental exercise I learned as a graduate student studying swarms of the Asian marauder ant. First, I follow an individual worker. Then I take in several ants collectively, a group of workers busy at a task. Finally, I liberate my imagination from what is directly before me, emulating German chemist August Kekulé, who discovered the beautiful structure of the benzene molecule in a dream. Allowing my reverie to expand beyond what is visible, I contemplate the functioning of the whole: all the ants, in the nest and out, with the workers integrated like the cells of a human body into a superorganism. This is more than mental gymnastics. By living socially, ants break through the glass ceiling imposed by their exoskeleton. At nearly 40 kilograms, a large driver ant colony is the size of an eleven-year-old boy. However, this particular young man would be a kind of superhero, one who can disassemble, such that his hands can stop a crime while his head commutes to the office to write up the news report-Superman and Clark Kent both at the same moment. Even an atom ant colony, which might fit within the head of a Camponotus gigas worker, is a superhero in miniature. An ant colony is an organism divided, with no loss of integrity. Its body spreads over space in pieces that give it a multitude of eyes and brains with which to glean nutrients, energy, and information. It does this with a microscopic attention to detail that no united body can match. It's more flexible than an organism, too: the superorganism counterparts to tissues and organs range from food transport teams to worker nurseries and are easily assembled or taken apart or shifted to a different function. Whereas a human vascular system has well-established roles, its colony analogue, the ant's trail system, is flexible. The column of ants arriving at a picnic follow a scent the workers leave on the ground, and such a chemical trail can later be co-opted for migrations or a fight. This fragmentation of a colony into individuals and groups of individuals helps a collective of ants to succeed when one big vertebrate would fail. In the Old World tropics, there can be a half million workers in a colony of the treetop-dwelling weaver ants. With a combined weight, at 14 kilograms, of a young leopard, the ants in the colony disperse among many nests of woven-together foliage located on frail branches, and thereby live where no hefty vertebrate could. Furthermore, most of the food available in nature is present in packets too small for a large animal to glean. A young leopard or a man would starve trying to gather the tidbits that make up the diet of a large ant colony, and neither is muscular enough to carry as much food as all those ants can move collectively. A whale trawling for zooplankton is the only vertebrate creature that scoops up as many bits of prey; indeed, a baleen whale is the marine equivalent of an ant colony (ironically, on land the closest vertebrate equivalent of an ant colony is an anteater). To accomplish this task as a group, bulky individual ants (even ones of weta cricket size) would be at a disadvantage. That's why so many plants have evolved to support ants, but not aggressive mammals or birds, as their guardians by giving ant colonies food and housing. Only ants can scour a plant's surface relentlessly enough to weed out its enemies, large and small (though certain mites play a similar role at an even smaller size). Their scouring behavior illustrates the repetition that are the hallmarks of large ant societies, such as army ants that crisscross the terrain within a raid, rooting out. An advantage to having many do the same thing at once is that if one individual fails to finish a task, whether subduing prey or building a trail, another will do it. Also, the frenetic workers in large societies often make mistakes; close inspection may reveal one ant going the wrong way or leaving building material at an inappropriate site. Such a blunder might be lethal for a solitary creature that has but one chance to do a job right; the same may be true for ant nests with few individuals, in which workers carry out every move with meticulous care. But in a large society, differences in performance assure that often enough a task is done to perfection. Even if lapses or errors occur, they are quickly corrected by another individual. In fact, with sufficient redundancy, variations in performance can lead to useful novelty and innovation, as when an ant on a busy trail to food overshoots the intended prey and, while she is lost, happens on another; or when a friendly competition for goods and services brings a kind of market economy to a nest, as Deby Cassill has shown. The redundancy of worker actions gives a superorganism other survival advantages as well. While a human life ends if a wound destroys the brain or heart, the functions of brain and heart are spread throughout a colony, making it harder to damage. To bring the comparison to the level of the society, ants have no central command center that can malfunction or be crippled or manipulated by outside forces-indeed, no established leaders. This means the destruction of small part of an ant population will never bring down the whole: contrast that with terrorism in humans. With the exception of reproduction (most colonies succumb to the death of the queen, who is the mother of all the ants in a colony), this safety net permeates all aspects of ant social existence. Find out more about the book, and pick up a copy, on Moffett's website. Mark Moffett has discovered new species and behavior while risking life and limb to find stories that make people fall in love with the unexpected in nature. Mark is a real-life adventurer with awards for writing and photography... and now the highest honors in exploration, the 2006 Lowell Thomas Medal, from the Explorers Club and Rolex, bestowed on him at Cipriani Wall Street; and the sixth Roy Chapman Andrews Society Distinguished Explorer Award (2008). With a Ph.D. from acclaimed conservationist Edward O. Wilson, Mark remains active in science, with over 80 peer-reviewed publications. He has penned more than 20 articles for National Geographic Magazine, which has featured nearly 500 of his images.